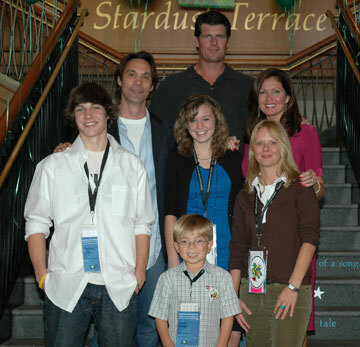 My son, Jared Winslow, helped me cover the 2007 Heartland Film Festival. What fun to share in the experiences and observations of a third-grader. This article is the first of two we are doing together. August Rush is 11-year-old orphan Evan Taylor (Freddie Highmore), who runs away to New York City. He believes that the music inside his head will lead him to his parents. He gains a mentor there, Wizard, a tough street-musician played by Robin Williams. Wizard is sometimes mean, sometimes not-so-mean. He is the one who suggests Evan use a catchy “stage” name and spots “August Rush” on the side of a bottled-water delivery truck. But Wizard apparently had ulterior motives here, wanting to keep “management” of this musical prodigy in his own hands. The stage name serves the plot by delaying identification of August as Evan, to those who would recognize him, until the movie’s climactic scene. The revelation of his identity to his long-lost mother and father (Keri Russell and Jonathan Rhys Meyers) and to the caring social worker (Terrence Howard) finally happens. The idea that music can mysteriously unite a family that was meant to be may not be very realistic. But it does convey the idea that a special connection can exist between lovers who were separated and between them and their children. And that makes for a good and interesting movie premise for somewhat older kids and adults alike. We felt, however, that the film ended a minute too soon. After all the build-up to these people finally coming together, the music working its magic, we never actually see the two parents and their child together in the same shot. But it was entertaining watching them get there. August Rush opens November 21, 2007, and is rated PG. See August Rush film production notes. (Photo above) KERI RUSSELL as Lyla Novacek and TERRENCE HOWARD as Richard Jeffries in Warner Bros. Pictures’ music-driven drama “August Rush.” Photo by Abbot Genser. Interestingly, this is based on a true story  though, as writer-director-producer Caroline Zelder revealed, the kidnapper was changed to give the film a more dramatic plot. We won’t spoil the story and tell you who did it. Emotional crying scenes can be difficult for actors. Thus, we were impressed with Chris Kelly’s acting when Elliot visits his father (William Baldwin) at the local jail. Owen Pearce’s age, especially as a six-year-old during filming, impressed Jared. We also thought Morgan Flynn did a nice job as Haley Dubois. The boys’ mother is played by Inside Edition’s veteran reporter Lisa Guerrero as she takes on her first co-starring film role. Guerrero is married to former baseball player Scott Erickson. After she landed the part, the film’s financers, who were backing Caroline Zelder and Frank Antonelli as the production team, backed out. Guerrero convinced Erickson to consider financing the family film, and when they met with Zelder and Antonelli, they reached a deal. Guerrero added “executive producer” to her credits. Zelder, Antonelli, Guerrero, and Erickson were all at the Family Movie Event. And all four reiterated a common film festival sentiment: there aren’t enough good family films. The big studios focus too much on big-budget films filled with violence and adult themes unsuitable for kids. And that’s what takes up most theater screens. The producers of A Plumm Summer are hoping to make a dent there by attracting a distributor and securing a theatrical release.